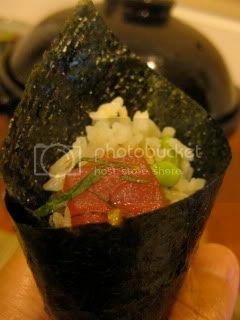 I got the nice wild-caught ahi maguro (tuna) from Fish King, so I decided to make chirashi sushi with it. For sushi rice, I did a blend of 50% white and 50% brown rice. It was tossed with some edamame. 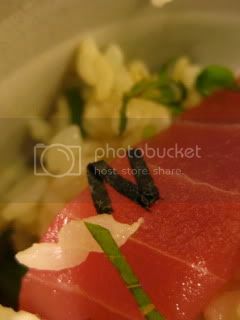 After the rice was tossed in vinegar seasoning, I scattered some sliced blanched snow peas and covered them with strips of raw tuna. To finish, I garnished it with sliced home-grown shiso leaves and nori seaweed. Delicious. You can find the variation of this chirashi sushi recipe on toiro's website. Please check it out. 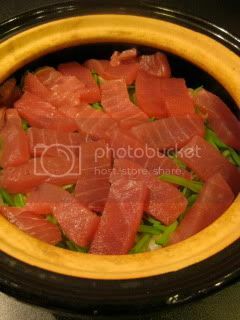 Donabe chirashi sushi was served at the table and scooped into individual bowls to enjoy. The shredded nori formed my initial (Naoko's "N") by accident! I thought it was a lucky sign:-) Toward the end, I took some rectangular nori seaweed and made my own temaki-sushi also. 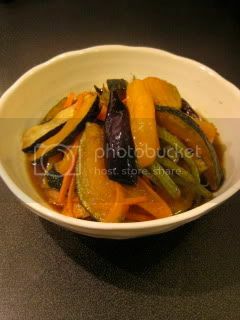 This evening's side dish was Summer Vegetables "Nanban-zuke", which recipe was introduced in my last posting. Deep-fried kabocha and other vegetables were marinated in the brown rice vinegar based sauce.